Crystals have the metaphysical power of healing. Using certain crystal methods, crystal healing can help a number of physical problems. 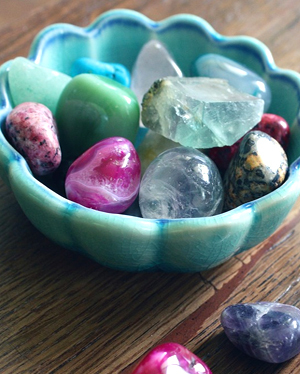 This metaphysical healing relies on the innate powers of healing crystals. For example, rose quartz is great for emotional healing, amethyst crystals for headaches, malachite for the stomach, lapis for anxiety, and jade for the heart…just to name a few. From as far back as the days of the legendary lost city of Atlantis, through the ancient Mayan and Hebrew civilizations, and including Far Eastern and Native American cultures, crystals and gemstones have been used both in spiritual rituals and as aids to physical healing. Today the practice of using stones and crystals continues. Not only with the aboriginal shamans of Australia who use stones to commune with spirits, but with ordinary people across the world who claim extraordinary results. How do crystals work? No one seems to know for sure. Tales tell that they were first used in Atlantis. Crystals became important to the people of that civilization who believed in their capacity to store and amplify any power source fed into them - physical, mental, emotional, or spiritual. Practitioners of modern-day crystal therapy believe that the stones' ability to work as conductors allow them to focus energy via a person's thoughts to stimulate healing - both physical and non-physical. However, in addition to medical controversy as to their efficacy, the use of crystals for healing is not an exact science. There is plenty of information available to describe which crystals and gemstones are good for treating certain ailments or for the prevention of certain conditions. The problem is that much of it appears contradictory. Still, thousands of people world-wide swear by the use of crystals for a variety of mental, emotional, and physical problems. There are numerous claims that they aid such in diverse areas as harmonious relationships, allergies, and spiritual awakening. Crystals are used in meditation and spiritual ceremonies, laid on the body during types of massage or bodywork, when a person is resting, or placed in drinking or bathing waters. It is claimed that an odd number of facets on the stone aid in healing, while an even number of facets create the best energizers. Red, yellow, and orange stones are said to produce energy, clear and aquamarine stones are healers, and lavender and blue-violet stones create calming effects. Here is a list of commonly known crystals and their reputed benefits. Amethyst: Headaches, eyes, scalp, hair, pituitary gland, balancing blood sugar. Psychic abilities, imagery. Purify and transmute negativity. Reduce anger, impatience, and nightmares. Spiritually uplifting. Aquamarine: Heart, immune system, thymus, lymph nodes. Calming, uplifting, flexibility, innocence, joy, creativity, communication, self-knowledge, confidence, purpose. Releasing anxiety, fear, and restlessness. Carnelian: Circulatory system, kidneys, stimulate appetite, emotions, sexuality, physical energy, celebration, reproductive system, menstrual cramps, arthritis, kidneys, gall bladder, pancreas. Confidence, assertiveness, drive. Citrine: Acid indigestion, food disorders, allergies. Cleansing spleen, kidneys, liver, urinary system, intestines. Mental and emotional clarity, problem-solving, memory, willpower, optimism, confidence, self-discipline. Reducing anxiety, fear, and depression. Coral: Muscles, blood, heart, reproductive system, thyroid, metabolism, spine, bone and tissue regeneration. Not to be used with high blood pressure. Protect and strengthen emotional foundation and enliven emotions. Diamond: Increase personal clarity, trust, confidence. Amplify thoughts, attitudes, strengths and weaknesses: Prosperity, generosity, love, spirituality. Emerald: Respiratory system, heart, lymph nodes, blood, thymus, balance blood sugar, childbirth, eyesight. Strengthen heart chakra for abundance, growth, peace, harmony, patience, love, monogamy, honesty. Lift depression and insomnia. Jade: Heart, thymus, immune, kidney and cleansing blood, nervous system. Courage, knowledge, justice, compassion, emotional balance, humility, generosity, harmony, wealth, longevity. Lapis: Anxiety, restlessness, insomnia, shyness, nervous system, speech, hearing, pituitary, inflammation, pain. Mind expansion, intuition, creativity, spiritual connection. Organize, quiet the mind. Malachite: Stomach, liver, kidney stones, respiratory system, immune system, vision, circulatory system. Release pain, inflammation, depression, anger. Stimulate psychic vision, concentration. Rose Quartz: Emotional balance, love, beauty, peacefulness, forgiving, kindness, self-esteem. Emotional healing, loss, stress, hurt, fear, resentment, anger. Align mental, emotional, and astral bodies. Sapphire: Reducing inflammation, fevers, nosebleeds. Hearing problems, TB, burns. Communication, depression, intuition, clairaudience, mental clarity and calm. It is suggested that you should never let anyone touch your crystals. Each crystal should be cleansed before use to clear any stored energy by either soaking it or burying it in the ground. Soaking: Have everything at room temperature. Soak the crystal in one cup sea salt dissolved in one quart of purified or spring water in a glass bowl. Meditate and ask that the crystal be cleared. Soak from 15 minutes to one full day depending upon how many people have touched the stone. Rinse under cool water and dry with cotton or silk. Burying: Wrap the crystal in cotton, silk, or linen and bury it in a place you feel comfortable. Leave at least 24 hours. Just like Reiki crystal also helps in self healing Scientist name MOSE was first to discover that crystals exhibits piezo electric vibrations or piezo electric currents which are helpful in fluent and persistent blood flow of our body as well as balanced secretions of glands which ultimately results in good health. Type of crystals & its applications for healing . Sushumna Nadi Meditation of crystals. Balancing of human glands through crystals. Use of crystals in Vastu rectifications. Balancing of chakras through crystals. © 2018 Om Counselling Centre. Copyright All Rights Reserved.